Few, if any decisions of the hive are made by the queen. Her role in any decisions made are restricted to her pheromone. A young queen with strong pheromone will help inhibit swarming. As she ages her pheromones fade, exerting less influence on the hive as a whole. It is her worker daughters that decide when it is time to swarm. They stop feeding her to slim her down so she can fly. It is the workers who will decide to replace her if she begins to fail. Even clipping a queens wing too short can cause her daughters to supersede her. Despite her royal status, it is the peasants that decide if she stays or goes. There is much that human governments should learn by studying honeybees. In order to sort through some of the confusion, I am... as usual, going to put my own methods in writing, pictures and videos. Raising a few queens each year doesn't need to be hard, or confusing. The two methods I have used will be the only ones discussed on this page. There are many ways to do it, but these are the two I have used. Cell Punch Method, which I originally read about at www.dave-cushman.net. BOTH methods are done in a similar manner, without the confusion of starter colonies, finisher colonies, or the need to graft. You need to understand the simplicity of what your about to do/read about. Nurse bees raise queens for three reasons. Swarming, superseding, and in an emergency. It IS that simple.. Everything else involved in queen rearing is just details relating to one or more of those three reasons. YOU make them queen-less and then insure they have what they need. Eggs/Larvae, plenty (lots) of nurse bees, plenty of food, and NO QUEEN. You have a perfect scenario to raise queens. Everything else involved, is just details that help in a given situation. Raising half a dozen queens for your 6 hives is really simple to do. Raising 60 queens means using more of those details to insure more cells are started and capped. Mel talks in the video below about his OTS queen rearing system. In attempting to follow the method as closely as possible, I found that it WORKS. I have modified slightly, and will talk about those modifications as we move along. Take the time to watch the vid if you can. On the Spot Queen Rearing Video. Rather than notching 7 or 8 cells with the flat of my hive tool, I use the corner of my tool and notched ONE cell, which actually turns out to be about three cells, so I squish the little larvae/eggs in the adjacent cells to make sure I do not get two or three cells together. I do this in four or five places on each side, making sure I do not put the notches adjacent to cells on the opposite side. Notching the cell changes the behavior of the bees toward that cell. They will now treat this cell exactly like the they would one of your punched cells or a grafted cup. Then simply put this frame in the Nuc built the evening before and walk away. Unscreen the entrances (depending on your temps) the next day and let them fly. An entrance feeder with water is a good idea if it is warm. Cooked bees don't make good queens, but I have heard they are fantastic dipped in chocolate. Another simple method.. Rather than use a nuc to make your queens, use the resources of an entire hive! Find a queen you like, remove her from the hive, making up a nuc with her. Find the eggs/larvae in the now queenless hive and notch those cells. Mark the top of the frames you notched. If there are eggs elsewhere you will need to make a careful examination or you may find the bees have built cells there in addition to, or instead of your notched cells. Over the course of the next eleven days, they will build EXQUISITE queen cells. Queens emerge on day 16. 3 days as an egg, 5 days as a larvae. The queen cell is sealed on day 8/9, and she will emerge on day 16. So you found a one day old larvae to use in producing your queen, which means you are already at day 4. Waiting eleven days will put you at day 15. If you mistakenly used a two day old Larvae you may have queens emerging.. TODAY!!!!!! Those queen cells can be moved at day 13, I do not recommend waiting more than 14 days. Always use the smallest Larvae located nearest unhatched eggs to insure they are freshly hatched. If you are unsure, then transfer the cells a day earlier! The best queens will be from larvae selected at their youngest age. I use Foundation-less frames, so it is quite easy for me to cut the cells from the frame to place in Nuc boxes or hives. If you use wax, make sure to notch cells that are not near a support wire. If you use plastic, then you will have to place the entire frame into the hive that needs the queen. If you use plastic foundation you may not want to notch more than two or three places, because you will need to destroy all but one or two of the cells. Picking the best looking one to allow to hatch. Using the Cell punch method is not much different. Same Nuc to raise them. The difference is the frames I built with JZBZ cell cups on them. It was a pretty easy modification to one of my own home made frames. You can buy these already pre-made from most of the supply houses. My Cell Punch tool made from a .44 Mag case and an old screwdriver that had a bad tip. I simply soldered the case to the screwdriver, then cut the end of the case off. I used sandpaper to polish the end of the case and sharpen it to go through the wax easier. Because it is soldered on, it forces me to pay attention to how much I warm it up to go through the wax. You want it warm enough to do the job, but not so warm it may harm or kill the larvae. I use a lighter normally, but have seen hot water used. Using a lighter works fine and takes less preparation. 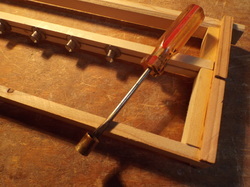 Carriage House Bee Products sells a pretty nice cell punch tool for $15.00 if you don't want to make one. My fancy Cell Punch station with Eagle Eye Ted trying his hand. The cup on the hot plate has bees wax in it. A note about the temperature of the bees wax. When punching the cell and then dipping it in the wax, your fingers are inevitably going to touch the hot wax. Make sure the temp of the wax is JUST enough to melt it so you don't burn your fingertips. The magnifying glasses with LED light are a huge bonus when trying to make sure you select larvae of the right age/size. The tool is home made, the hot plate picked up at a yard sale for fifteen bucks. The Magnifying glasses were thirteen dollars from Amazon WITH shipping. The frames are home made, and the JZBZ cups come in a pack of one hundred for less than ten bucks. There is nothing expensive or difficult about doing cell punch, OR OTS. Explanations can be confusing until you actually DO IT, then you will wonder what all the fuss is about. Finding larvae of the correct age is important. Looking across your frame you will usually find large larvae, and as you move one direction or another the larvae will get smaller, and eventually you should find eggs. The line between eggs and larvae is where you need to be. Finding a newly hatched larvae floating in a tiny drop of royal jelly is what you want. This larvae should be no larger than the egg in the cell beside it. This is your goal, and is a 4 day old larvae. Now you gently slide your punch tool around that cell and push it through slowly, often twisting the tool slightly to help cut the wax smoothly. Use your finger, a dowel or another object at hand to push the cell up through the tool so you can get hold of it without crushing it. The punched out Cell is carefully formed by compressing the opposing cells into a cone shape so they can be fitted into the JZBZ cup. A little warmth from the lighter to make the wax sticky, or better, a tin of melted wax to dip the side you formed into before sliding it into the cup. Just don't warm the larvae! VERY simple to do once you have done it a couple of times. Once you have the number of Cells you wish to be made into queen cells mounted in the cups, it is just a matter of mounting your bar and putting it into the nuc. Because you are using the complete Cell, you don't need to worry about getting the bees to polish the cups for acceptance. Because you are using a cell already started by the bees you don't need to worry about priming the cup with royal jelly. Because you are only raising a few Cells/Queens, you don't need to worry about Starter and finisher Colonies. This one strong Nuc will EASILY produce and care for ten or less queen cells well packed with Royal jelly. BOTH methods require feeding of this Nucleus colony. Insuring they have Pollen and nectar in the brood frames or extra frames you added. This is important even if there is a good flow, because you have taken mostly nurse bees on the frames of brood. There will be few foragers. If you did get some foragers, they will return to their own hives rather than this nuc. However, you have also taken CAPPED brood, ready to emerge or already emerging. (No eggs or larvae) As these bees emerge and begin to care for the queen cells, the older bees will begin foraging. Perhaps I should describe the nucleus hive I am talking about at this point. You will make up your strong nuc on the evening of the day before you intend to notch or punch cells. Darkness is coming, and it is usually cooler at night. Less worry of overheated bees locked into a nuc box. I do not like to let bees remain queenless for more than 24 hours. The following morning I can begin crafting my queen cells, and I have a few hours leeway if there are problems or complications. This should be fun and relaxing! Ideally, you will locate frames of CAPPED brood, WITH honey and pollen in them. If you can find frames with all three things, you will want to put four of them into a five frame nuc box, WITH the bees still on them. These are HOUSE bees, not nurse bees. So you will want to give this nuc a couple good shakes of nurse bees from frames of OPEN brood to get the nurse bees as well. If you cannot find frames with honey/nectar, then find three frames with as much capped brood as possible, also with the bees on them. Add a frame that has honey/nectar and pollen, leaving the fifth slot open. In the second case, dont forget to shake the nurse bees into the nuc as well. These frames can be from a good strong hive, or they can be from two, or three hives. Put an empty frame of drawn comb, or even a new undrawn frame in against the wall as a place holder. Put a feeder on this hive. If it is really warm, also put a jar of water on this nuc and screen the entrance. The next morning you will install your notched frame, or your cell bar, depending on which method you choose. Remove the place holder frame, and slide the frames of brood apart. Make sure there is nectar/honey and pollen on one of the center frames, and slide your frame or cell bar in beside that frame, in the center of the box. By morning the bees will KNOW they are queenless. It takes them about fifteen minutes to realize this, so waiting 8 - 12 hours will insure they are pretty desperate. NOTE IF NOTCHING; You must be using wax foundation or foundation-less frames. If you have plastic, you will need to transfer the entire frame, so you should only notch in two or three places, and obviously you cant cell punch if you have plastic foundation. Wired wax frames will require you to be aware of where the wires are. You cant cell punch through a wire, and if notching use cells away from the wire so they can be cut out. When you have the cells mounted, or the frame notched, go put it into the nuc. The following morning, set the nuc where you want it to go, unscreen it, and leave it alone for two or three days. Check the cells for acceptance. If you are happy with how many cells they have started, then close up and wait for the tenth/eleventh day from when you installed the frame or cell bar. If they only selected a few, or none, now is the time to start over. In the morning, 10 or 11 days from when you put the cells in to be built, you check your cell bar or notched frame. At this time the cells should all be capped, put them back and go make up your Nuc's, or make your selected hives queen-less. Preferably by setting the old queens aside in another nuc. So in the event there is a problem, then you can recombine them later. Virgin queens get eaten by birds, they make mistakes and try to enter the wrong hive after their mating flight, etc etc.. so always save the old queens if at all possible! That evening remove the queen cells from the colony that raised them. Put one IN that colony, and put the rest in the other nucs you built earlier, and or in the hives you made queen-less. Come back in a four days and check to see that the virgin queen has emerged. The Queen cell will have a nice round opening at the bottom of the cell. If the cell is torn open from the side, or has not opened, the queen was killed or has died in the cell, re combine the original queen in an introduction cage and try again in a few days. ONLY open the top and check the queen cell. Don't disturb them more than necessary at this point. If everything went perfectly, from start to finish, the Queen should have eggs in cells by day 27 - 30. If you see no eggs, give it two or three more days and check again. You should see eggs, and with a bit of luck, the beautiful fat queen YOU helped them produce. If you still see NO eggs, wait two or three more days. If there are still no eggs, re introduce the old queen using the newspaper combine method. Drones are important. Doing this in early April where I live would be pointless, because there are no drones yet. This point alone is why the southern breeders are so much more successful. People are hasty creatures. They want what they want, and they want it NOW, so southern queens raised through March and April are shipped in late April and early May. I can't get a well bred queen until the middle/end of May, maybe early June. But Unless your queen is dead or laying Drone eggs, you CAN afford to wait this long to re queen. It doesn't have to be hard. Doing a walk away split is the only easier way, but this way you have better results with less problems, and get more queens. You remove some of the variables, and YOU decide which larvae are used to produce those queens. Continue to use the queens YOU like best to do this, and believe it or not, you have initiated your own breeding program. The days I speak of in counting down are from the day YOU start, the day YOU notch or punch cells, NOT from the day the egg is deposited in the cell. Time table below may help understand. KNOWING when an egg is laid is less important with the method above. As long as that Larvae is smaller than an egg, and beside/near unhatched eggs you SHOULD be right on target. Count this as day 4 in the development cycle and be sure to transfer cells on or before day 15, because the queen will emerge on day 16. We will assume the date is May 8th when the egg is laid. 5/8 Day 1 Egg is laid by the queen you like the best. 5/10 Day 3 Eggs will begin to hatch late. Create the strong nuc or remove old queen from the hive you intend to use in the evening. 5/11 Day 4 Notch or punch cells with day old Larvae this morning, and install in the preferred nuc or hive prepared the evening before. 5/13 Day 6 You can check for acceptance today. If enough cells were accepted you can continue, or start overt with a new frame or punched cells. 5/17 to 5/19 Don't disturb!!! 5/20 Day 13 The cells can now be moved. 5/21 Day 14 The cells can be moved. 5/22 Day 15 You moved the cells RIGHT!!?? 5/23 Day 16 Queens Emerge!!!! 5/25 Day 18 remove cells that did not hatch or were destroyed and recombine old queen. 6/15 Day 39 Check for Larvae. If no Larvae or eggs recombine old queen. If eggs and Larvae are present? Pat yourself on the back! More information on management and Nucs on the Nucleus Hives Page. There are many methods, and many opinions of how best to raise queens. MOST of the methods described are for raising large numbers of queens. I don't need large numbers, I only need a few each spring/summer. So even for an old guy with beat up hands and eyes it is possible, and even preferable to raise my own queens from the best of the bees I have available. Update at the bottom of the page! How to pick which queens larvae to use? I will discuss the things I look for below. YOU know, after a bit of time which hives you like. which build up rapidly, which produces best. Which are the calmest, and which are the most resistant to diseases and mites. Keep notes on your hives so you can go back and look over those notes. When you have 20 or more hives, notes begin to become really important, at least if your memory is as bad as mine. Pick your BEST queens to draw eggs and larvae from, and you will be much happier with the queens produced. Temperament of the bees is my first priority. I REALLY dislike mean bees. If I have a queen that makes 200 lbs of honey and is the strongest hive in my yard, but her bees are MEAN.. I replace her. Owning mean bees is like having a mean dog. Eventually, it WILL get you or someone else hurt. I have seen bees chase people off 50 yards from their hive. When you force yourself to inspect them, they will go 300 yards to sting someone, and I have seen that as well. There is one thing worse than getting stung because you keep mean bees. Your mean bees are putting out drones, and they are mating with MY queens, which means I will be requeening.. AGAIN, OR, destroying a hive. Keeping mean bees is like keeping generic non mite resistant queens. You HARM everyone around you, including the feral hives. So DO NOT be an idiot and keep mean bees because they produce a lot. You hurt more than yourself. If you like mean bees, move south and keep Africanized Honey bees. Wintering is my second choice. Surviving the winters. If your bees can't winter, or struggle to survive and have to be fed by early March, then they cause too much worry. Especially in a winter like the 2013/2014 winter. Bitter cold for nearly 4 months without a cleansing flight. Bees that cant break cluster and move to stores WILL starve right where they are, with honey 2 inches away. Bees that have too large of a cluster will consume more of their honey and starve before you can check on them. Pay attention to how they winter, how they come out of winter, and how rapidly they build up when winter is over. Resistance is my third choice. If I have to struggle to keep up with treating them they get re queened. Mite infestation will transfer to other hives from drifting bees. Chalk brood, Foul brood, Nosema, etc, etc.. if you struggle with these things, consider getting genetics with better resistances. Treatments cost money and take time. The less you have to treat, the better off you, and your bees will be. They will survive with less struggle on your part. Your supposed to be enjoying keeping bees, not struggling and getting ulcers. See Honey Bee Care section for more on resistances. Production, strangely, is the Primary, and final criteria I pay attention to. I would be happier with 50 lbs of honey from bees that are easy to keep than 70 lbs of honey from bees I had to struggle with, worry about, and treat often. On the other hand, if they did not produce surplus honey, or only produced 20 - 30 lbs in their second year, despite other hives producing 50 to 70 pounds, they would get a new queen. Keep track of your hives. Within a couple of years you will know which hives you like the best. Which have the best temperament, which produce the best, which winter the best, and which of them deal with diseases and pests the best. Use eggs from THAT, or THOSE colonies to make your new queens. You can't control the drones the new queens mate with, but you can control who their momma was! Drones are raised from unfertilized eggs. The drones next year will be directly from your best queens, and have no relation to the drones the new queens mated with. So if you keep track of your hives, you should be able to improve them with each passing year. A YouTube link to a Brushy Mountain Video below. I recommend this video highly if you have the time. It mirrors many of my own beliefs and methods, like rotating out the comb. Also producing good queens from the local area. Good information for Varroa here too. Shane does a good job. Newspaper combines usually work VERY well when combining a nuc. I have had very few problems. Installing a new queen into a production hive from a queen cage is not as easy. OLDER bees are not as ready to accept a new queen. Unless they were making supersedure cells, they were perfectly happy with their old queen, and suddenly, they are asked to accept this new queen they know nothing about.. There is a further difference to consider. Has this queen been in a cage for a few days? More than three? If so, it is harder to get the bees to accept her, because she is NOT a laying queen. So some care is needed here. Having found charged queen cells started in a hive at around 23/24 hours after being made queen-less, I am reluctant to leave a hive longer than 20 hours before introducing a queen, or even a queen cell. Still, longer is better. The more upset they are the better their chance to accept a new queen. I will make them queen-less in the afternoon or evening, and introduce the queen cage around noon the following day. When putting the new queens into the production colonies, I like to give them a little time. A day with the cork in, and three days with the candy side cork pulled. NO HOLE punched through the candy, I want it to take the full three days for them to chew through the candy. When installing the queen cage, in a colony or in a nuc, I spray the queen cage, AND the top bars with accompanying bees with light sugar syrup. This makes them begin cleaning and licking up that syrup. They think this is WONDERFUL and I hope put it together with the scent of this new queen as a positive thing. They will begin accepting this queen and feeding her through the holes on her cage right away. Late on day four, or any time after day five, check to make sure the cage is empty, remove the cage, close up the hive and come back in a week or so to check for eggs. Queens being introduced to younger bees are generally accepted gratefully. Introducing a queen that was laying two days ago or less is also accepted easier. Less concern or care is needed. When introducing a new queen to a queen less nuc made up of nurse bees, allowing them to release her by chewing out the candy plug is usually more than sufficient without waiting the extra day. I have WATCHED queens released into a production hive with SMOKE and plenty of syrup sprayed on them directly from the cage, with no time for the bees to get used to her. My method of spraying some sugar syrup on the cage and the top bars comes from my mentor introducing queens instantly with ONLY syrup and a bit of smoke. I have read about popping them in with smoke alone, or during a powdered sugar treatment, or using Honey bee healthy, but when it comes to introducing a new queen, I want to do as much as I can to insure the queen is accepted, so I stick with the things I know work the greater percentage of the time. I pay for queens I order, so I want to give them every chance possible. A little extra time, and a little bribery with light syrup. Putting the queen cage between frames that have capped brood is another thing I always try to do. Emerging bees have never seen a queen, so they think THIS ONE smells heavenly. Installing a queen is not something to try to rush in my opinion. To date, using care, and allowing them time, I have only had one queen introduced fail, and I later learned the hive was just beginning to produce laying workers. My fault for not looking closer. As already stated, I don't put up with them, even if they are fantastic producers and survivors. I keep bees because I enjoy it. Trying to care for a colony that has my Veil coated in three layers of bees, then follow me back to the house and hang out waiting for me to come back out isn't much fun. ALL bees will get more defensive in the fall when they are preparing for winter. They have to go out of their way to protect the colony. If their honey gets robbed in June they still have time to rebuild. If their stores are robbed in September or October, it may mean they will starve to death that winter. If you have a particularly aggressive production hive, pull a strong Nuc from it, and use them to produce queens using larvae from a queen you like. When the capped cells are ready, SPLIT the mean hive into however many queen cells you had the strong nuc build. Destroy the queen from the mean hive. 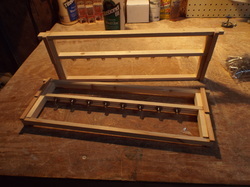 Split into the Nuc's, leave a box with frames in the original location. The older field bees will return to it. When the Nuc's are established and the new queen emerged, Shake the original hive out on the ground and remove it completely. The field bees will pick a new hive to call home. If you don't want more hives, then your option is to try to re queen that hive. If that fails or you want to just be rid of it, kill the queen, shake it out and remove it. According to research done by David Tarpy at NCSU queens mate with an average of 13 to 15 drones. A few queens were found to have mated with only one drone, and others with as many as 45 drones. Mating frequency.. or, queens that mate with more drones have a larger sperm count in their spermatheca. Large queens were shown to have a larger spermatheca, mate with more drones, and were capable of storing a larger amount of sperm. Less than 3 million sperm were considered low quality queens, 5 million were considered high quality queens.. It correlated that the large fat queens WERE the best queens. His research indicates that the queens we as beekeepers are getting from breeders are as good now as they have ever been. The research is ongoing in an effort to determine what is happening to cause 31% of queens to fail. Pesticides from treatments? From crops? Fungicides? Banked queens? We will have to wait to find out. Also noted in later research.. He found out that the queens that mated with more drones gave off a stronger pheromone and were better treated and cared for by the bees in the colony. Low quality queens were accepted, high quality queens were ADORED. A lot to extrapolate from that! 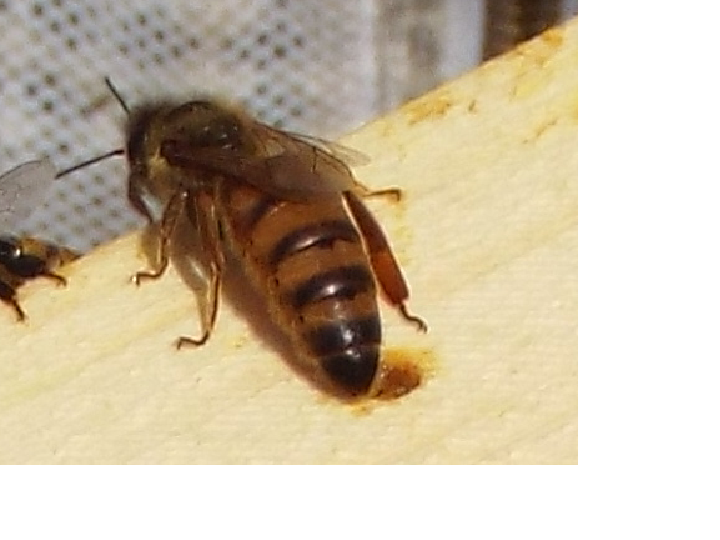 Pictures of queens from my hives. Some raised by my hand, the ones that are marked are purchased VSH queens. How do I produce more queens, without getting complicated? I have a VSH queen I like very much.. So I pulled her from her hive on a frame of eggs/Larvae. Pulled a frame of capped brood to put in the nuc with her. A frame of honey, a frame of mostly pollen and some honey, and a clean drawn frame that was empty. A jar of syrup on top, and dropped them in an outyard. I left her old hive and the nuc alone for four days. The Morning of the fourth day I went to her old hive, and went through all three boxes (Mediums) frame by frame, and removed EVERY queen cell they had started, and every cell that LOOKED like they had started or might start. "WAIT! Why didnt you let them raise the cells and use them?" Answer -- Because I need more than the five or six cells they started, and I prefer my cells over floating a larvae out of a cell to make a queen. 19 of the 20 were being drawn out and were PACKED with royal Jelly.. I put the bar back in and walked away until day 13.. Pulling the bar on day 13 revealed 17 capped queen cells..
Time to make up nucs! For 2015 I did the same thing. I started with 24 cells and ended up with 18 nucs. A is a little more complicated than using the nuc, but the result was well worth the effort. I have the basis to produce more queens in the spring, and nucs to overwinter, to replace my losses or sell. Hives to produce honey next year, hives to produce bees for nucs and queens next year on a scale a step beyond sustaining my own apiary, and I didn't have to try to graft! It should be self evident that drones are important. First, the drones are necessary for the mating of queens. Second, the drones are necessary for a balanced and happy hive. If... you attempt to put 30 frames of worker comb in a hive, the bees will figure out a way to get their drones.. they will make brace comb and burr comb for drone cells, OR, they will re work some of that worker comb into drone comb.. I have seen it many times.. Normal plastic foundation with worker cell imprint on it, and the bees have turned it into their drone foundation.. No matter WHAT you do, they will NOT draw that piece into worker comb..
My answer, is to GIVE them what they want. I see ten to fifteen percent Drone comb.. Often, ONE foundation - less frame is enough, occasionally they will draw up to TWO of those foundation - less frames into drone comb.. Excellent, when I find it I put it where I want it, and use it to keep track of mites.. I can decap the sealed drone brood and kill all those mites in the cells, the bees will clean them out and start over again.. Knowing where they are is helpful for breeding purposes as well.. Most of my yards are three to five miles apart in a large circle around my town.. I have the area pretty well locked down.. barring the feral hives.. Typically, a queen will not mate with her own drones if she has any choice.. SO, by keeping a couple drone combs in my other hives, I can CHOOSE which of those drones I want out there to mate my replacement queens. The hives I LIKE, i let have all the drones they want, and in fact may give them some drone comb from other hive for that queen to lay in. The hives I do not like, I de cap the drones each time they are sealed. The bees pull out the bodies, clean the cells, and start over.. Yep, its ugly, but it serves the purpose I need. Varroa reduction, and better selection for local queens. The Feral hives will also benefit from those resistant VSH drones, with each cross, I HOPE to make them more resistant, more capable of surviving, and in the roundabout, when they send out their drones, I will not be wasting my time if my new queen mates with those drones. In fact.. If you have one hundred hives and wish to improve your genetics. Purchase ONE WELL BRED queen. From her, produce 99 more queens and re queen your hives.. When your breeder queen, and her daughters have filled the area with their drones, raise another batch of 99 queens.. THESE queens are going to be mating with the vast amount of BETTER, and or PURE Drones now flying.. In a single summer you can take several yards of marginal bees, and turn them into well bred high quality bees. Drones are a product of un fertilized eggs. The queens you produced are putting out drones who take after their grandfather, not the drones their mother queens mated with. It's all a matter of determination on your part. If you have feral hives nearby, it is highly likely you have just improved their genetics as well. One small step at a time, each individual beekeeper can make a difference! Most of my previous experience with queens was from our bees raising their own. Before the internet, we did not typically order queens from anywhere. The bees made their own queens. Inheriting a few hives from my mentor means I still have these genetics.. Mutt queen genetics, and I love them! Ron Wehr In Kalona, Dark Carniolans he originally brought in from Caifornia.. They do well here. Last year I purchased ten nucs from Ron, and I lost only one of them over winter. Ridgetop Apiaries, Mike Haney. These queens were VSH Gold, and they were/are golden queens.. I ordered 5 of them, and 4 were successfully installed. Two of them survived their first winter, and built up very well. They showed some hygienic behavior, uncapping cells and removing larvae, but still needed treated in August with 9 mites per 300 bees. I am overall happy with these queens, better winter survival would make them excellent queens. I purchased five premium select queens, and set them into an outyard that is about 5 miles from..... anything.. We shall see how they fare.. I will add, that communication with Mysti Jacob can be sporadic. Being hard of hearing I like to use the internet, but did not get replies to my inquiries in a reasonable amount of time. Calling often resulted in an unanswered call. Mysti was quite pleasant to deal with when I did get to talk with her, and I have a feeling that she is trying to do too much herself, and is thus not as available as she should be. I requested overnight shipping, and that went well.. The queens arrived in great condition, and are healthy looking active dark queens, with attendants, and the queens are marked, which is a bonus. There is a story that goes along with Waynes bees, but will be posted another time and place. I drove down to NC to meet Wally Swaim and spend a couple days there.. It was an eventful/enjoyable trip. I returned here with two Nucs and two queens, set them up and got them rolling well. They were wintered as I winter all of my bees, and set up beside the Old Sol bees in my farthest outyard. All four Survived the winter, and the mite count on these bees is currently threshold level. We will see if they can manage the mites with no treatments. As of the end of April 2016 I am preparing to make queens from these queens, and it needs to be done soon or these bees are going to swarm!